When craving a crunchy, salty snack, ever thought about grabbing a green bean chip? These crispy snacks are the perfect healthy alternative to potato chips, loaded with vitamin A, iron, calcium and fiber. 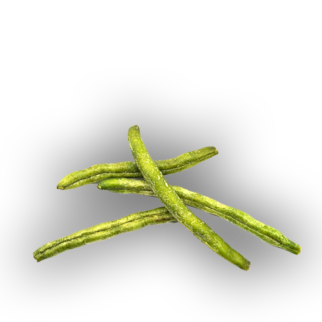 Red River’s string beans are harvested, washed, and vacuum fried. This process removes moisture, requires less fat than traditional frying methods, and helps retain natural color and flavor. Green bean chips are sold separately or included in vegetable mixes.